What does a trailer full of opportunity look like? If you ask DH, he’d say trouble. My answer is of course lots of furniture ready for makeovers and stuff with potential like this DIY twin headboard bench I built this week. Last month I kind of went on a shopping binge at our local Habitat for Humanity Restore. It was just one of those days where every time I turned around I saw another gem in the rough. You know how it goes, if you don’t grab these kinds of finds right then and there, you’ll spend the next two days regretting that you left the whatever it was behind, go back and of course it will be gone. 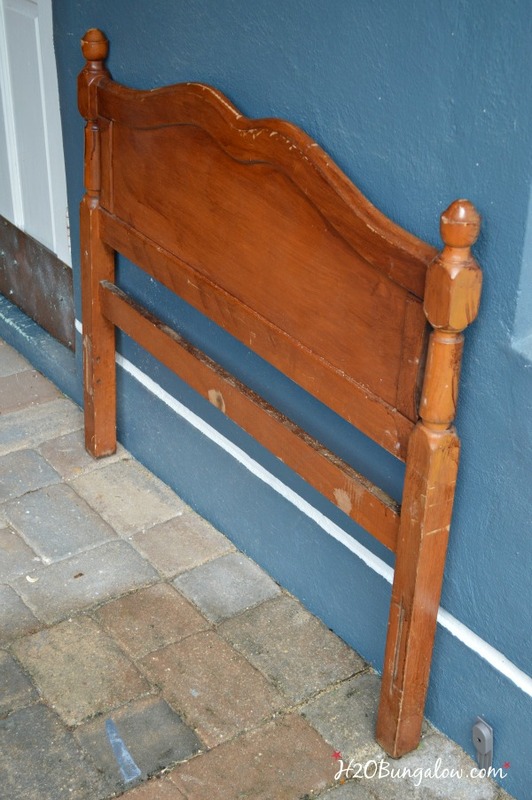 This twin headboard was one of my finds. 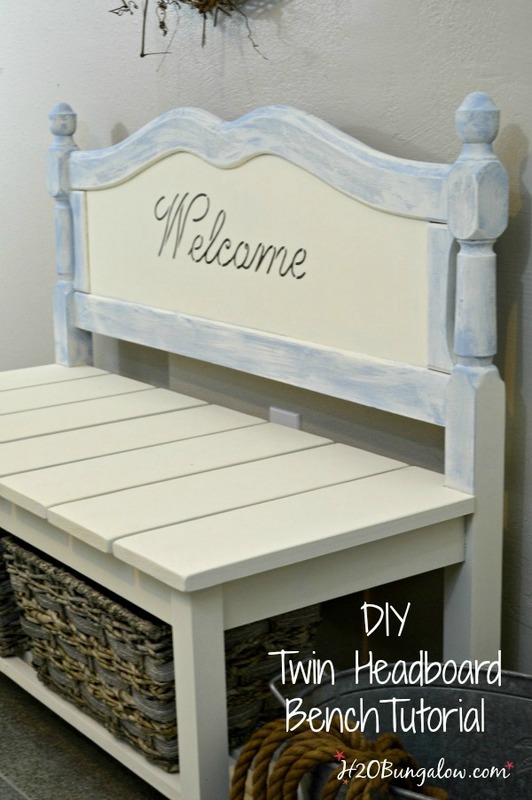 It was a nice petite size and I knew it would make a great DIY headboard bench. What it didn’t have was a good foot-board that would work for side arms. 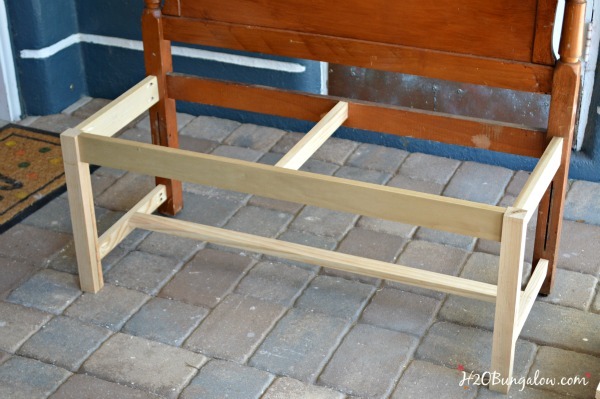 So I figured this would be a great project to share for this months Power Tool Challenge and share how to make a DIY twin headboard bench with a shelf for storage. I made a basic frame using some poplar I had left over from another project and select pine (better quality) for the seat. Since each headboard bench is unique, there aren’t exact measurements I can share. The picture is easy enough to see and get the gist of where everything went. The seat is approximately 18″ tall and about 18″ deep. center brace and bottom brace are 1″ x 2″. 1 1/2″ pocket screws – This is a fantastic deal on bulk pocket screws! I just ordered one for myself! 4″ foam paint roller – don’t buy the high density ones, they don’t work as well as the soft ones. All the boards were a simple straight cut using the compound miter saw. When you’re making cuts, be sure to get as close to your cut line as possible…on the outside of your measurement line. All of the wood joints are connected with pocket holes and screws using a Kreg Jig. I used two pocket holes for each joint and attached them with 1 1/2″ pocket screws. The Kreg Jig was set to 3/4″. 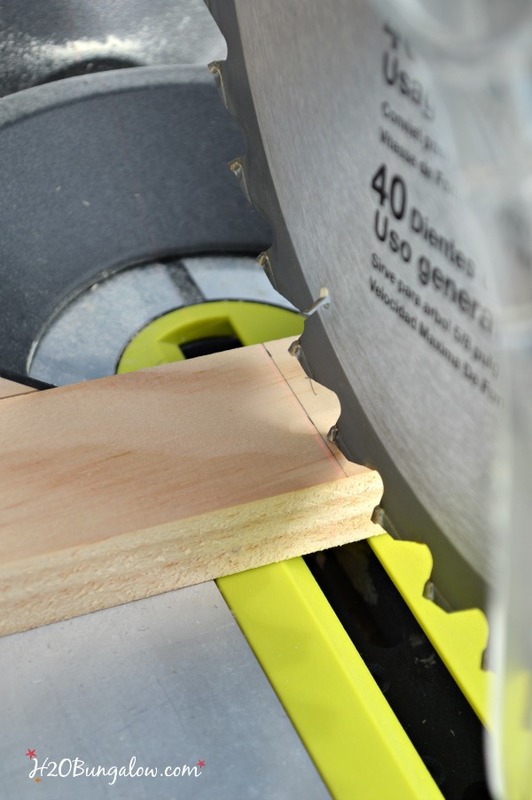 My Dad shared this trick with me and it worked so well I have to share it with you… Make a template of wood pieces to fill the voids between the slats out of scrap to space slats evenly. I used my Ryobi Airstrike brad nailer to attach all the slats on one side, and then moved the spacers to the other side with these same spacers. Here’s how to figure the size and number of spacer templates needed. 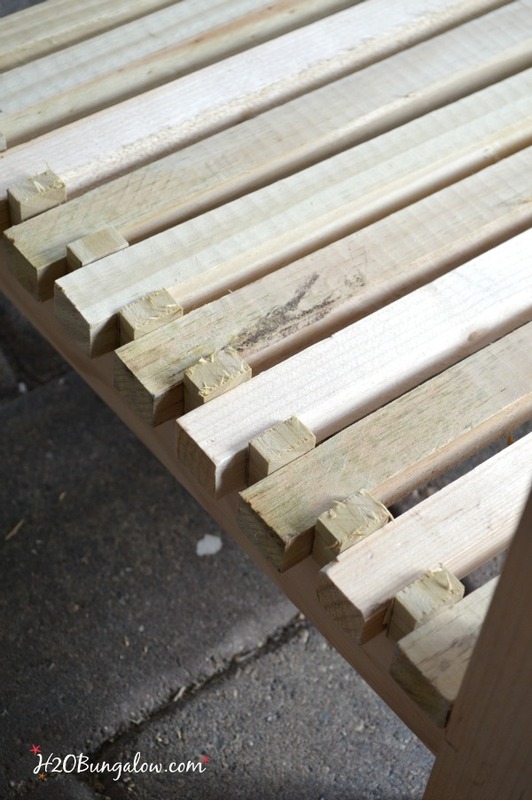 Measure the total distance between the bench legs, subtract the length of the slats together, this will tell you how much space needs to be divided evenly between the slats, divide that by the number of spaces/voids and this will tell you how long to cut each spacer template. Make a spacer for each void in between the slats at that size. It will save a lot of time and your slats will look perfectly placed. Attach the shelf slats first and the seat boards last. Depending on the length of your twin headboard bench you may need to notch the end board with a jigsaw to fit around the post. Use wood putty to fill in any depressions from the nail gun and paint. Don’t the slats look great and perfectly spaced? The stencil was a last-minute decision, I think it was the perfect finishing touch. I do, and can picture this petite twin headboard bench sitting in a pretty foyer or hallway. It’s a far cry from my very first headboard bench project a few years ago. Which just goes to prove… if I can learn this and build a bench, anyone can! The Power Tool Challenge Team events are always a good time with loads of creativity. Check out the rest of the teams projects for this months theme of Organization below. 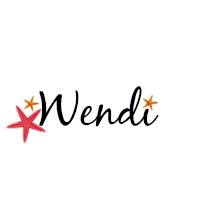 Click on any of the pictures to see that project. Just popping in after following the link from Hometalk and wanted to say again how much I love this great bench. Your instructions are perfect and two grandma’s are going to tackle it soon!! Pinned and looking for a headboard! 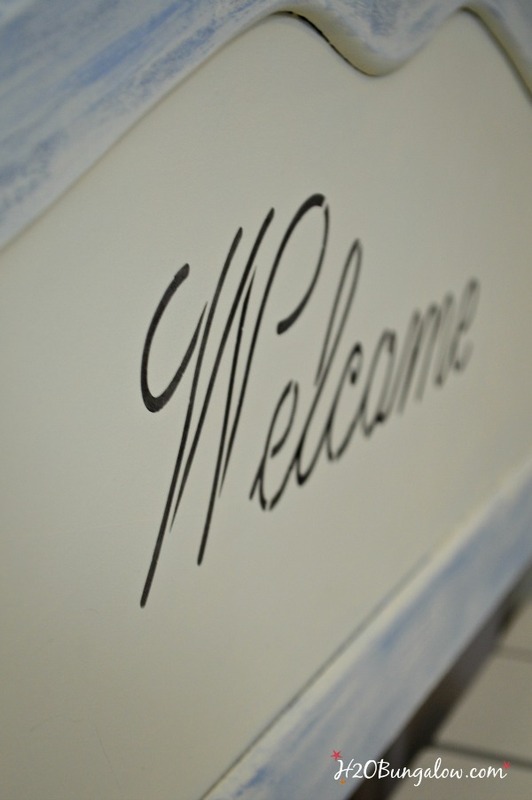 Hi Vickie and welcome! I have no doubt that you two grandmas are going to do an awesome job on this project! The twin size fits perfectly in smaller rooms. Have fun with your project! To use the bench outside, in the Chicago area, what would you seal the stencil with so it doesn’t peel or come off? Hi there! To answer your question on weather or not to seal the paint on a bench and stencil in the weather I’d definitely seal the entire paint job with an outdoor and UV protectant sealer if it would be exposed to the sunlight as well as the weather. With that said, I would only use a bench made with treated wood in the weather as well. I built another headboard bench a few years back and that one sits on our covered front porch. It doesn’t get direct exposure to the elements. I hope this answers your questions. Thanks for your visit and happy creating! Oh my, what a clever and striking makeover! You certainly gave the headboard a new life. Great tutorial, Wendi. Thank you 🙂 I enjoyed this project. Twin headboards are plentiful in thrift stores and so cheap. I’d been wanting to tackle a bench project for a while. Hope your weekend is going well! Great tutorial Wendy, love your project. Oh that Kreg jig is on my shopping list, I so need one of those! Thanks so much Brenda:) Headboard benchs are so much fun to make. 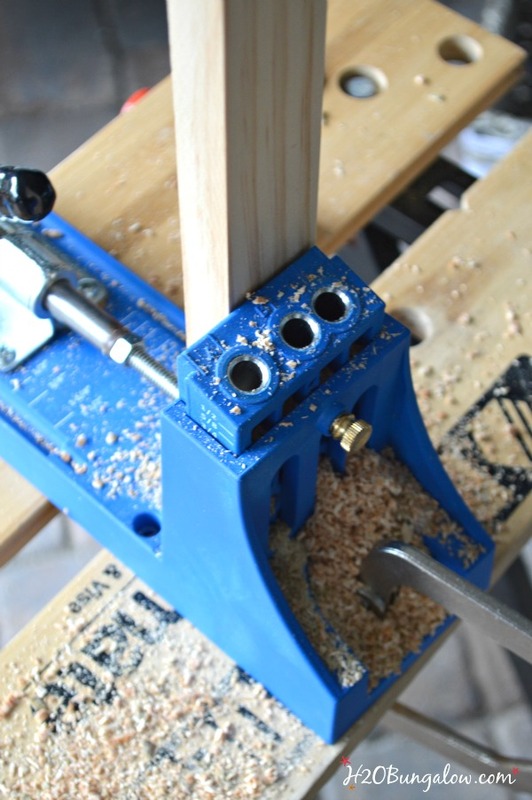 A Kreg Jig is a must have item! Seriously, it’s a game changer and you’ll wonder how you ever got along without one once you have one. Thanks so much for your visit! Love how it turned out! Very nice design and colors! Have a great weekend! Great bench! Thank you for the tips and tricks too .. I will try to remember them when I attempt one of my own. BTW … you have some great tools 🙂 I hope you have a great day! Amazing makeover!! Great storage and a pretty place to sit! Love it! Thank you Debbie! I’ve been itching to make one of these for a while, so when I found that headboard it was a no brainer! I love the bench. The instructions are very detailed and easy to follow. Thanks for sharing. I love it! You made it look so easy to build, but knowing me I’m sure I could make it difficult lol. Thank you for sharing at Merry Monday! Thanks so much Amanda. It’s not so hard to make, you should try it! Wow, I love this! Makes me want to pick up an old headboard the next time I see one at a flea market, just for this purpose. Thanks for sharing and great tutorial! Cara Headboard benches are so much to make. A twin headboard is the perfect petite size for small spaces, this one is only 41 inches wide. Have a great day! Well done, Wendi! I love the design – simple and sturdy. Great repurpose! Hi Larissa & thanks so much friend:) I’ve always wanted to make a smaller version of my big bench and the twin headboard was perfect. Thanks for stopping by! Wendi you’re bench is SO cute! 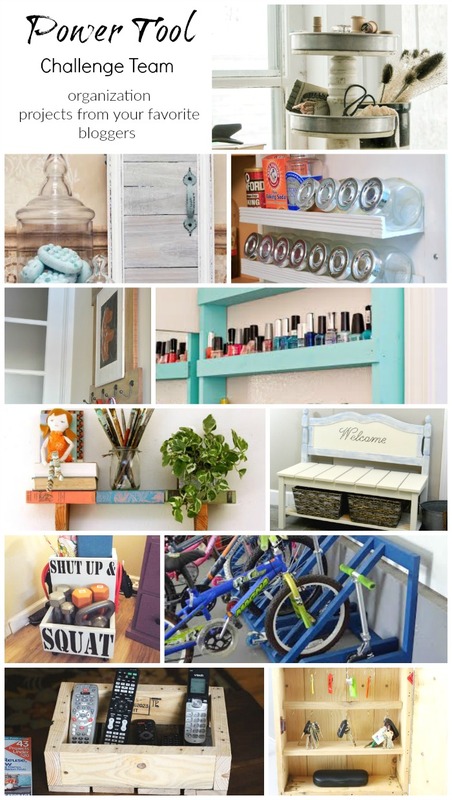 Love the detail slats on the bottom shelf… so cute! Thanks so much Maryann!I wanted to make a petite one because the others are all too big for the small beach houses out here. Oh I love this idea so much! Especially since there is a storage space for baskets underneath! Thanks so much Janell:) The storage was a fun twist and I think it fits really well for the petite size:) Thanks so much for your visit! It’s one of the prettiest benches I have ever seen! Hi and thanks so much:) It’s a petite bench which fits great in our area. Yes…my Dad has been full of good tips and helping since he got here. I’ll have to make sure I tackle all my home improvement projects while he’s still here! Have a great week and thanks so much for stopping by! Your bench is so so so cute! Beautiful transformation Wendi. Thanks so much Amy! I’ve been itching to make another bench project for the longest time. I’m glad I finally had the chance. Super tutorial Wendi, you make this look easy enough for beginners. Having the right tools make all the difference. Hi Gail & thank you:) It’s funny ou mention that, I brought it to the shop this morning and it’s been a hit. 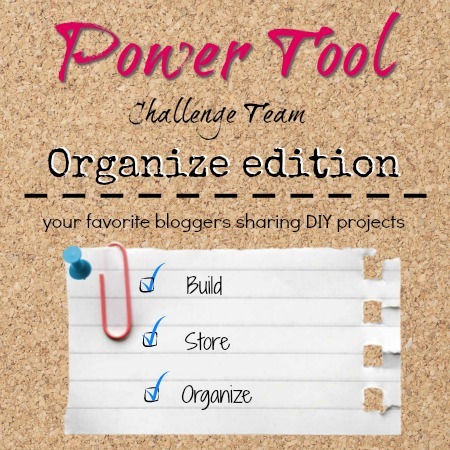 You are so right that having the right tools makes the project much easier. This isn’t a hard one to make. I found I couldn’t use my nail gun for some of the seat and lower shelf. There ain’t enough room to get in. Hi Jo, Thant’s a tough situation when building! I’ve run into it before too. I hope you were able to improvise and finish your bench! Thank you and your Dad for that awesome spacer trick!!! I have a headboard waiting for a bench transformation so I’ll be using that tip for sure. Your bench is gorgeous Wendi and great tutorial too! Thanks Marie! I’ll let Dad know his tip was popular too, he’ll be tickled. This was a fun challenge! Really pretty Wendi, and I love that you put a shelf on the bottom for extra storage! 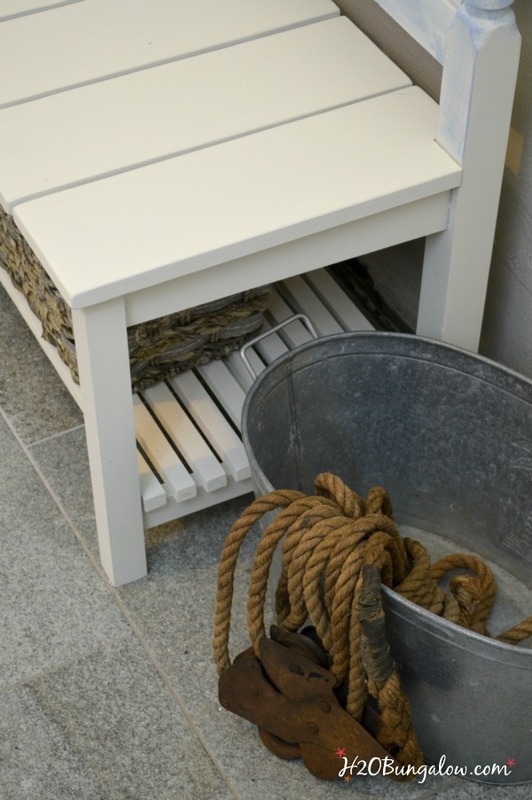 I love the bench and the storage underneath. 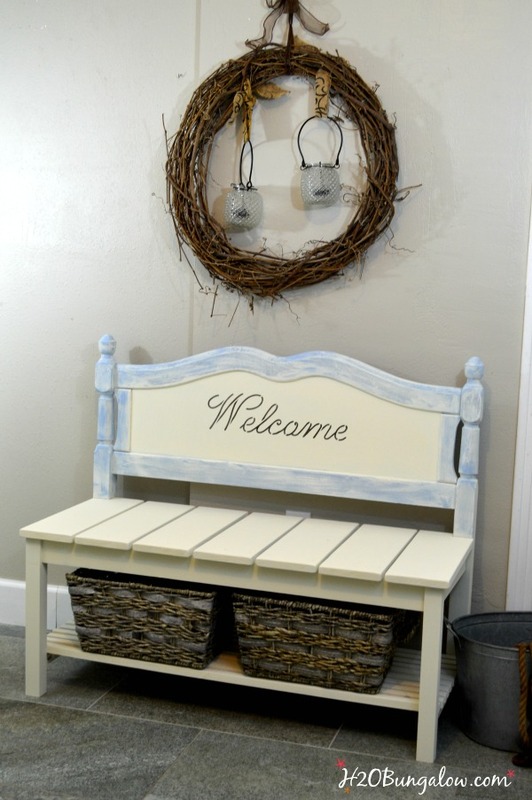 The bench would look so cute in the foyer, or the mudroom. I love it! The spacing on the slats is perfect. Thanks for the tips! The stencil is the perfect finishing touch. I am now on a mission to find headboard! Pinning! Cher..I LOVE our local Restore, of course I usually find way too much stuff on a good day:) I know you’d upcycle something fabulously too.